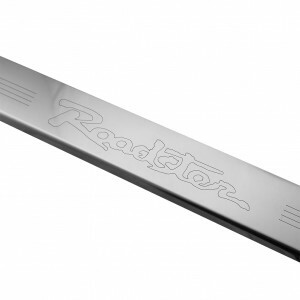 These high quality mirror polished stainless steel covers are engraved with the "Roadster" script and replace the metal door sill inserts on the original plastic door sill bases. They effectively protect your door sill paint from the hundreds of shoes that scuff your sills. The covers come with 3M adhesive tape and install in a few minutes - everything is provided for the installation. Sold as pair (set for both sides).